The Rio Olympics have proven once again that the human body is an incredible, complex machine — but machines need fuel, right? And lots of it. As this infographic of the diets of ten Olympians shows, maintaining an Olympic-level physique involves a lot of careful meal planning. What Olympians eat varies from sport to sport, depending of whether athletes are looking for strength, endurance, or (as is usually the case) some combination of both. One thing that stands out in this infographic, created by Sports Betting Online, is protein, protein, protein. Swimmer Michael Phelps famously consumes large amounts of pizza (though it seems that he may have switched some of that out for grilled chicken). Olympic weightlifter Morghan King goes for red meat, fish, and eggs to keep her strength up. 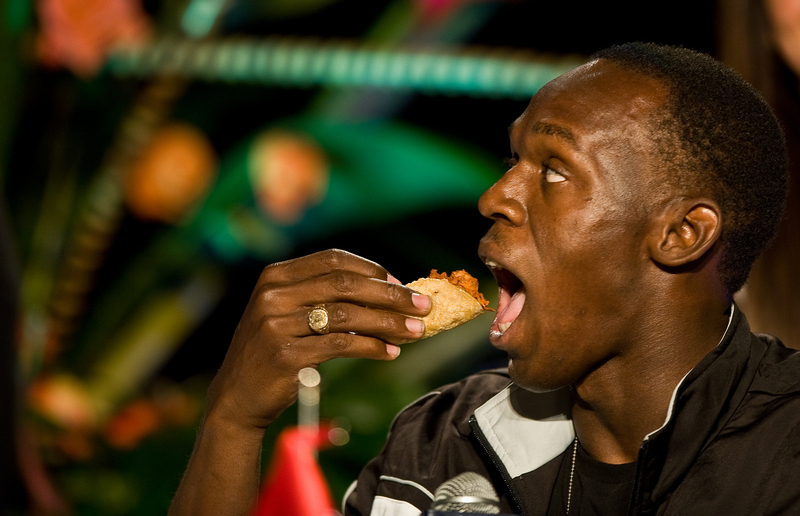 Usain Bolt opts for low-cal proteins like chicken and fish. Ample carbs are also a common theme, especially for endurance athletes like cyclist Sir Chris Hoy. Many of these athletes eat a lot (Phelps, for example, consumes about three times as many calories as the average guy), and they eat often. Although some Olympic athletes stick to the traditional three-meals-per-day structure (plus some snacks), others have a lot more. Phelps has five full meals or more each day, as does King. Synchronized swimmer Anita Alvarez eats every three hours, while sailor Robert Scheidt has eats six times a day. Heavyweight boxer Anthony Joshua and triathlete Jonny Brownlee each eat eight and nine small meals a day, respectively. Which diet sounds most appealing to you? I’m struggling to choose between that of long-distance runner Mo Farah, who gets to eat dark chocolate as a snack, and rower Helen Glover — because she gets to eat second breakfast, like a hobbit. Who doesn’t want two breakfasts?